Sterling silverware such as spoons, knives, forks and ladles. Sterling silver kitchenware such as teapots, trays, cups and saucers, bowls, cups, plates, goblets, salt and pepper shakers, etc. 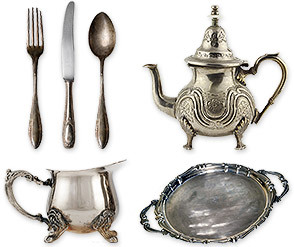 The condition of your items doesn't matter – tarnished or broken silver is welcome. Incomplete sets are fine too. Get cash today! Stop by our convenient Northeast Ohio location today, or call 216-650-GOLD for more information. 650-GOLD is one of Cleveland's top estate silverware buyers, with decades of experience you can trust. For a confidential consultation, please call our estate buying department at 216-650-4653.